Would you like a job like no other, that takes you to places most people can only dream of? Then consider a career in Mars Fleet Medical. Dedicated doctors in all specialities, dentists, nurse techs, nurse assists and therapists are needed aboard ships of Mars Fleet, as well as on planet-based and orbital stations. If you have a health-related qualification from a recognised institution and are made of the right stuff, then Mars Fleet Medical may be the place for you. 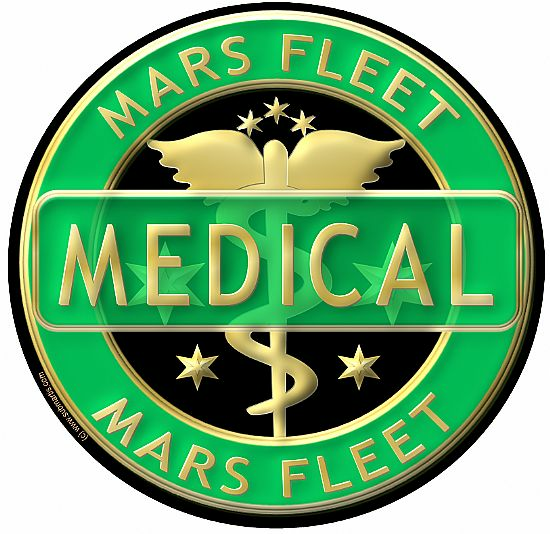 Further training in Mars Fleet Medical Corps will give you the knowledge and skills to find your way to the part of the Service that is right for you. It will also give you the right to wear the green badge of Mars Fleet Medical, the passport to a life of scope that offers both satisfaction and the knowledge that you are doing your best for the safety and security of your home planet.